We met Andrei and Dulce (and not Fernando), the "Ciclonautas" in Queretaro, Mexico, but they passed through the Casa de Ciclistas several years ago. As young Mexicans with very limited resources, they set off on a journey all the way from their home city to the bottom of South America, Ushuaia, where we're going too, and they made it. They worked along the way, getting a tiny sponsorship in Honduras, but mostly just working at their trades in each city until they had enough to continue. And they made it all the way, on no money. We met Andrew on our yacht trip from Panama to Colombia. (There were 5 of us cyclists on that boat! Pius and Stefan were on it too). Andrew is teaching everywhere he goes, and working with teachers and students around the world via his website. Pius and Stefan are the blazing fast guys on the recumbent bikes WAY ahead of us. They're young and full of vim and vigor. They race each other between cities and go farther in a day than we go in three. And they're great people. Pat and Cat hosted us when we were going south through California and they had just gotten home from four years riding around the world (North America, Europe, Africa, and South America back up to California). They're even older than we are, if you can believe that! And they have yet another adventure planned for this year. Pat is 68 and Cat is 55 and they're going strong! Florian and Rebekka and Chan are three of our favorites. We met them in Oregon and spent several delightful nights in the same campgrounds. Florian and Rebekka were young people riding across Canada and planning to ride down to South America about 5 years ago when she discovered she was pregnant. They got jobs in Vancouver, got stable, had Chan, and waited for him to be old enough to continue, and that's what they did. 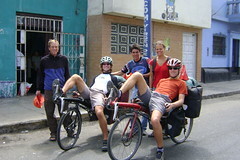 When we met them in 2006 they were pulling Chan (then 3) in a kid-trailer, with all the gear for the three of them. They have now made it all the way to Argentina and plan to get to Patagonia sometime in the next 6-9 months. They are heroes! And of course these amazing people are just a drop in the bucket. 998 parties (including us) have signed the log to date at Lucho's Casa de Ciclistas.